Shadowy Men on Shadowy Planet’s 1988 tribute to the Ventures Christmas album. "Faster Santa Claus, Ho! Ho! Ho!" A page from Laura Park’s sketchbook. Based on this flickr feed and her two 'Do Not Disturb My Waking Dream' minis, I am predicting great, great things. Very reminiscent of pages from the Acme Novelty Datebooks in both quality and density. Interesting holiday video that uses the bells, buzzers and tones of microwave ovens to play a christmas tune. The syncopation is a little weird, so I couldn't tell what it was that was being played until I read the tags. Pinup model Bettie Page died this week. 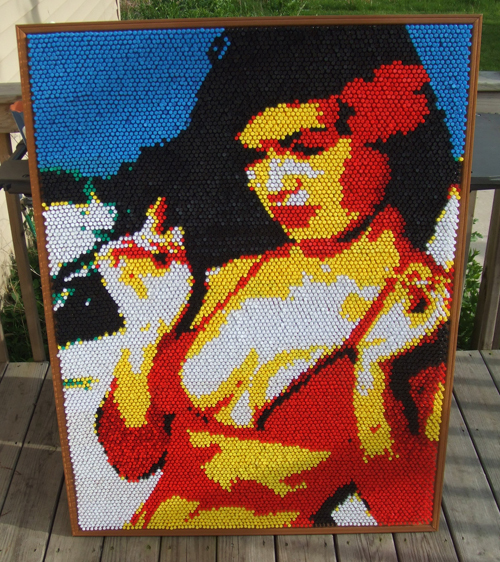 I don’t think I ever posted images of the insane push pin mosaic I made in 2006, but since it used an early photo of her as source material, this seems like an appropriate time to do that. There’s really not much backstory to this – the concept occurred to me and seemed pretty fun, and I was in the middle of a long period of indulging my tendency to make ridiculous mosaics. Many projects of this nature (ie Large-scale mosaics built from non-traditional art supplies) yield cries of “Too much free time” and the like, but I would submit that in practice the actual assembly is meditative in a weird, procedural, decidedly non-mystical way. The finished mosaic now lives in my Wife’s office. Below: Pins in bulk, source material, and a peek at the workarea. More angles of this mosaic, and two other ridiculous mosaics can be seen at mosaics.kempa.com. I think I’ve finally worked out enough of the bugs to mention without coder shame that Suburban Sprawl Music has launched our 2008 Holiday compilation. 44 artists from Michigan and beyond contributed songs this year. Ironically, I think this is the first time in three years that none of the songs are about unemployment. This year I decided to update how the holiday page works, dragging it kicking and screaming into the world of 2007 web technologies. You can now play any song in its entirety by clicking on the title / artist, and we’ve cleaned up the downloading interface so everything is (in theory) easier to use. It should be working in all major browsers, but if you find anything weird, let me know. I might cry, but I still want to know. I couldn’t decide on a song from the Ventures Christmas Album to attack this year, so I made up one of my own – a sort of Ventures Holiday Music Fanfic offering, if you will. As with everything, I put this off until the absolute last second, and ended up learning all the parts, recording them, and throwing together a final mix in the span of about six hours. My one regret: I was without a drum key, so the snare sounds like balls. I will get over it though. I always do. You can download the MP3 here, or I’ve embedded it below for easy listenin’. The boxes were sent to websites appreciated by the animation crew behind the film; images of each unique box are being posted here as they surface. The third panel of this strip PERFECTLY captures my experience with well-intentioned familial efforts to give the gift of comics. I cannot adequately communicate how much I am loving Kate Beaton's strips as they appear online.